" A] gorgeous, multifaceted examination of the war Americans call the Vietnam War--and which Vietnamese call the American War...As a writer, Nguyen] brings every conceivable gift--wisdom, wit, compassion, curiosity--to the impossible yet crucial work of arriving at what he calls 'a just memory' of this war." 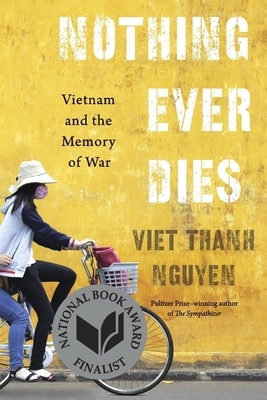 "In Nothing Ever Dies, his unusually thoughtful consideration of war, self-deception and forgiveness, Viet Thanh Nguyen penetrates deeply into memories of the Vietnamese war... An] important book, which hits hard at self-serving myths." "Ultimately, Nguyen's lucid, arresting, and richly sourced inquiry, in the mode of Susan Sontag and W. G. Sebald, is a call for true and just stories of war and its perpetual legacy."